For generations, the fertile Hiddenlands were shared by the peoples of the Five Realms. The Elves, Mages, Dwarves, Halflings and Humans lived peacefully with each other, though they increasingly engaged in fierce competition for the prosperity and glory of their respective nations. And so it was that when the divisiveness threatened to break the thousand-year peace, the Goblin Hordes from across the sea unleashed a devastating surprise attack, and the peoples of the Hiddenlands could not unify quickly enough to repel them. Remnants of each of the realms fled by ship, until they at last discovered a new, unoccupied land upon which they could begin building their civilizations anew. The old rivalries would remain, of course, but perhaps this time, their competition with each other would not welcome disaster. It was a time of hope, a time for exploration and construction, and a time of renewed competition in a new world they called Pandoria. In the "gamer's game" Pandoria, players discover this new land by placing tiles, and they claim its territory and resources by placing their people. When a type of terrain is completely surrounded by other terrain, every worker on the borders of that terrain gains its resources. Although more than one civilization will usually benefit, each player tries to gain more than the others. Mining gold gives you income to buy cards that have two options: buildings and spells. Acquiring wood allows you to build that side of the card for permanent advantages, while mining crystals gives you the power to use the card for its one-time spell instead. Excess resources can be converted into prestige Points, and some buildings can generate more. 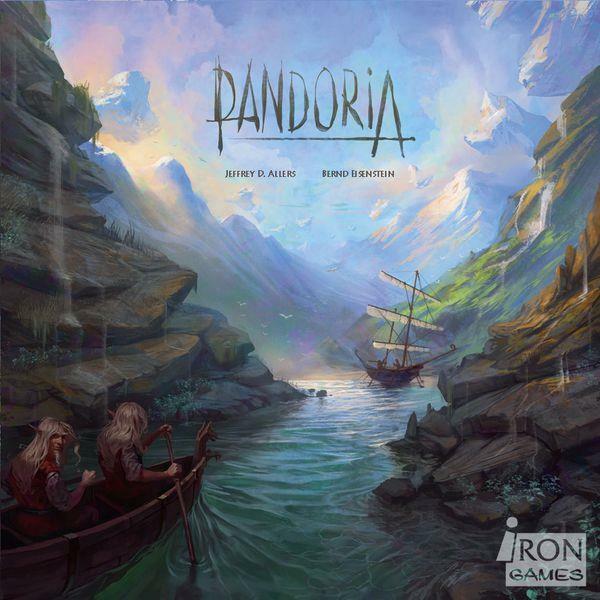 When the new land has been fully explored (all tiles have been placed), the player with the most prestige is declared the most powerful nation of Pandoria and wins the game! 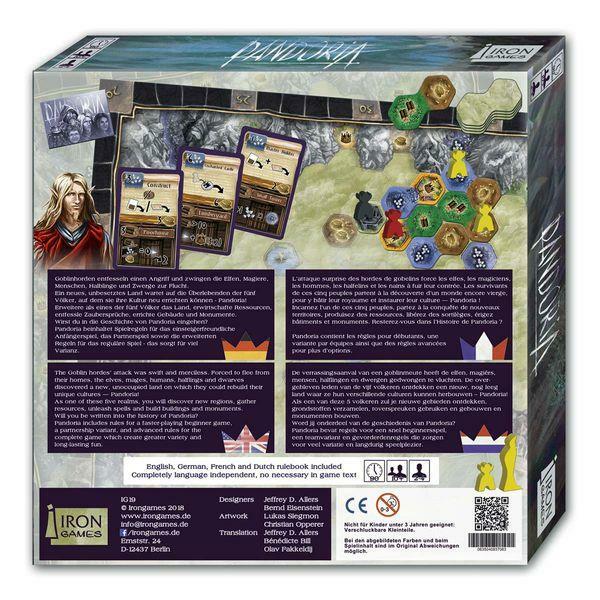 The game includes a streamlined beginner game, as well as expanded rules for the complete game that includes asymmetrical player powers.